In a video posted to YouTube by the National Atomic Testing Museum in Las Vegas (seen above), the resident skeptic of the TV show Chasing UFOs, debunks a famous UFO video that was provided by the Mexican Air Force to Mexican UFO investigator Jaime Maussan. 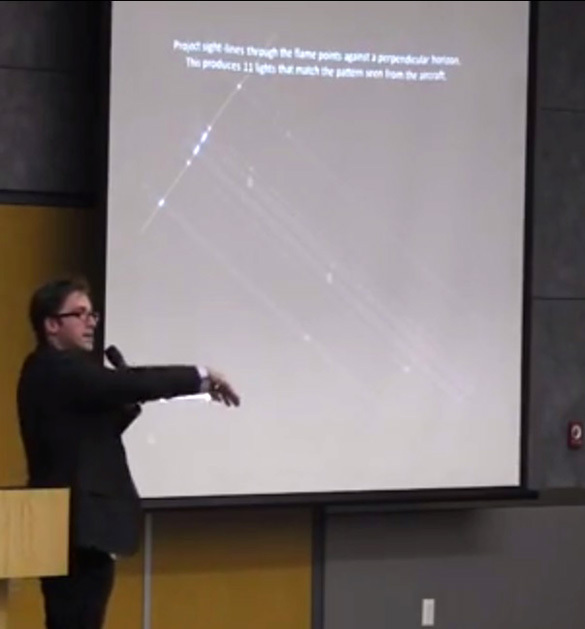 The video posted today was from a lecture by scientist Ben McGee, a co-host of the show Chasing UFOs, and Ben Hansen, one of the hosts of the TV series Fact or Faked: Paranormal Files. They discussed what it was like doing paranormal investigations on TV. McGee says it was frustrating trying to do a real scientific investigations with very limited time and resources. One of the investigations Chasing UFOs conducted on the show was of a famous UFO video from Campeche, Mexico. In 2004, the Mexican Air Force sought the help of UFO researcher and journalist Jaime Maussan, and provided him the UFO video. They said the footage came from one of their planes outfitted with a FLIR camera. This is a sophisticated camera that captures heat signatures. 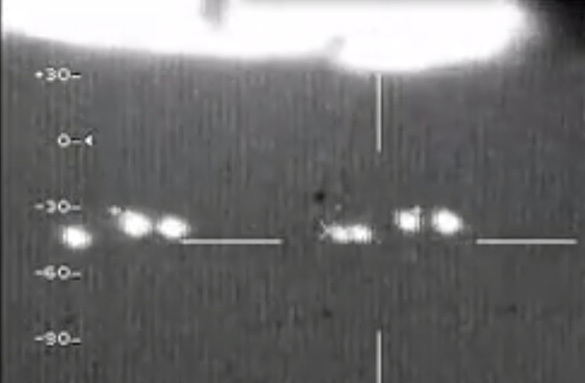 On the footage, several points of light seem to be following, and even surrounding, the military aircraft. It is very compelling video, and has been the source of much debate. Much like that which will likely ensue in the comments below and on our Facebook page when we post this story. The next thing McGee looked into was the appearance and the apparent motion of the objects. He noted that they were points of light, and they never broke formation. No matter how much the camera moved around and panned and zoomed in on the objects. They were always in the same sequence. McGee also found that the leading skeptical hypothesis was that the lights were actually from oil rigs out in the Gulf of Mexico. However, the oil rigs were 100 miles away from the airplane. Ben thought that idea was a stretch, and they tested this theory on an episode of Chasing UFOs. The crew rented a plane and took up cameras and a FLIR system. They flew a similar path the Mexican Air Force took, but couldn’t see much. They had to get very close to the oil rigs to pick them up with the FLIR. 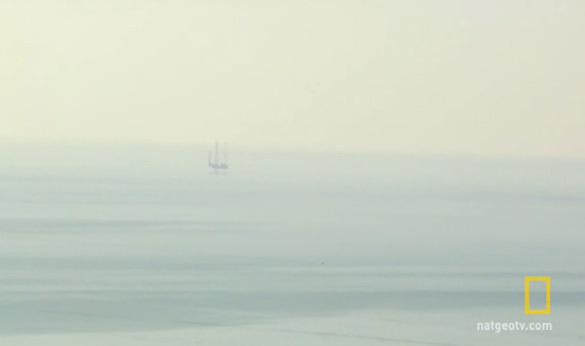 However, the oil rigs did not have flames while they were filming. 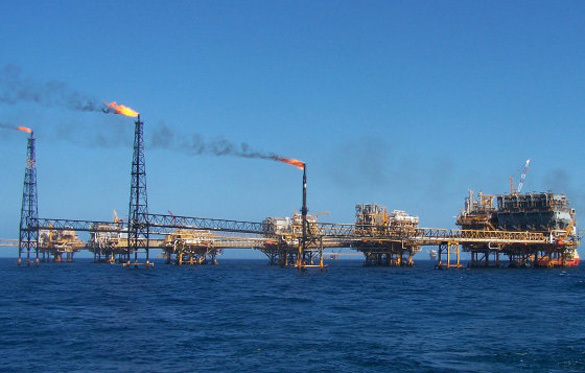 Ben’s other co-host, James Fox, agreed with Erin and said that their test proved that the oil rigs were not what the Mexican Air Force caught on camera. However, Ben disagreed. In his presentation, he also noted that they were using a less sophisticated FLIR system on the TV show. Ben decided not to abandon the oil rig theory, but to look at it from a different perspective. He decided to examine the pattern of the lights and compare them to the oil rig towers. He especially noted that there were a couple of groups of three lights. He found that the towers also were often grouped in threes. Ben also found an image of two burning vents from the group of oil rigs that looked like two of the lights in the UFO video. So, Ben says he decided to see what pattern the towers would make if somehow conditions were right for the Mexican Air Force FLIR to pick them up. He knew where the plane was, and where the towers were, so he had enough data to make an accurate estimation. Ben drew site lines from where the plane would have been to the horizon, and his pattern matched exactly what the Mexican Air Force FLIR cameras caught. But Ben says that was not good enough. He also noticed that what would have appeared to have been one light to the FLIR camera was actually two lights, one in front of the other. This being the case, Ben thought he could predict that at some point in the film, that light would separate into two lights, as the angle the plane viewed those lights changed. 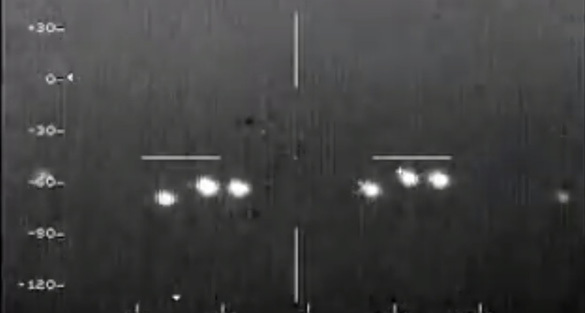 Sure enough, he found that the light did appear as two lights in part of the Mexican Air Force video. As for the apparent motion of the lights, Ben says that was due to the plane moving and the clouds in-between the plane and the oil rigs. The clouds appear to go in one direction and the lights in another, but both are stationary. See any flaws in Ben’s analysis? Or maybe you think he did one heck of a job getting to the heart of this mystery. Either way, tell us what you think below.